Video: In tropical attire, Lincoln leads wire to wire | Let Teddy Win! The Nats racing presidents chased the rain away Friday night by trotting out their Hawaiian Shirts, and decided to keep it away Saturday afternoon by wearing them again. 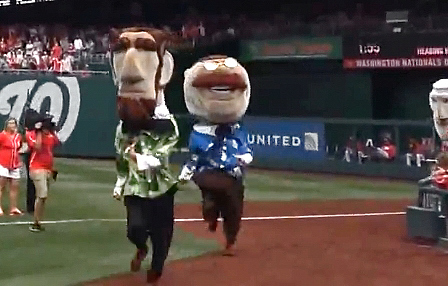 With Lavar Arrington nowhere to be seen, Abe Lincoln jumped out of the starting gate in the fourth inning and led the presidents race wire to wire. It was a surprisingly clean performance to match the efficiency of Nats starter Tanner Roark, who raced through the Padres lineup for a complete game 3-hitter.